Every once in a while, car designers are given the leeway to really apply their talents and get to create something truly astonishing. This is one of those moments. The i8 is BMW’s answer to keeping the performance car relevant and justifiable in a CO2 constrained world, which makes it a very important car in our book. As you would expect, this has required some seriously challenging engineering. First the structure is radical, with an aluminium chassis (‘Drive module’) containing crash structure, suspension, batteries, petrol engine and electric motor, combined with a separate (‘Life module’) passenger cell made of cutting edge carbon fibre reinforced plastic (CFRP) which is around 50% lighter than steel and 30% lighter than aluminium. The drivetrain is equally impressive with an electric motor driving the front wheels, a 1.5-litre, 3-cylinder turbo petrol engine powering the rear via a six-speed semi-automatic ‘box, and a modest-sized BMW developed lithium-ion battery pack in between in the vacant transmission tunnel. Thanks to a useful 34-mile pure electric range and a 42-litre petrol tank, you can cover over 330 miles in one go. Of course how you cover those miles is configurable. You can force the i8 into front drive electric mode at speeds up to 75 mph, save the batteries for later or recharge the batteries via the petrol engine (rear-drive), combine the two for maximum performance or combine the two for efficiency (four-wheel drive). In full attack mode you get a very healthy 369 bhp and 420 lb ft of torque to play with. 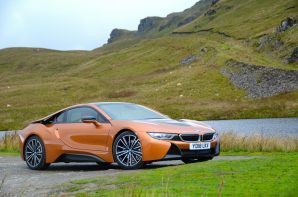 So the i8 is properly quick and with 50:50 weight distribution, a sensible kerb weight, and a low centre of gravity it’s rapid through the corners too, but what about efficiency? Well we’ve said it before and we’ll say it again, the plug-in hybrid fuel consumption test produces crazy figures so ignore the official data. However BMW has helpfully provided some more realistic figures for comparison (see below). The good news is that in electric-only mode it is very efficient, even for an electric car, which translates into very low CO2 emissions even if you use standard grid electricity. Once you start using the petrol engine CO2 emissions rise markedly but thanks to the hybrid ability, fuel consumption is significantly better than you have any right to expect from a car with this level of performance, so in context it is an efficient package. Stunning looks, full on performance, a 34-mile electric range, cutting edge materials, and environmental responsibility combine to make the i8 one of the most exciting, advanced, and, crucially, desirable cars you can buy. How do you make a 21 Century performance car? Just ask BMW.